It is a propagandist’s dream to live in relative obscurity while seeing his work repeated and embraced across the land. 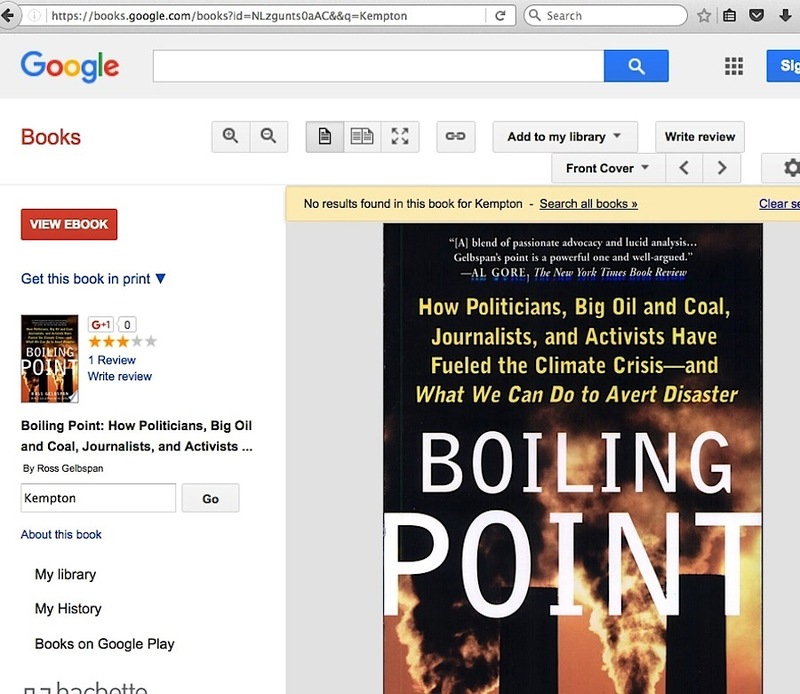 People have asked me why I dwell on global warming issue book author Ross Gelbspan, who was at the peak of his fame over a decade ago. Let me show you how it is not the man I dwell on, but his words and the outgrowth from them. 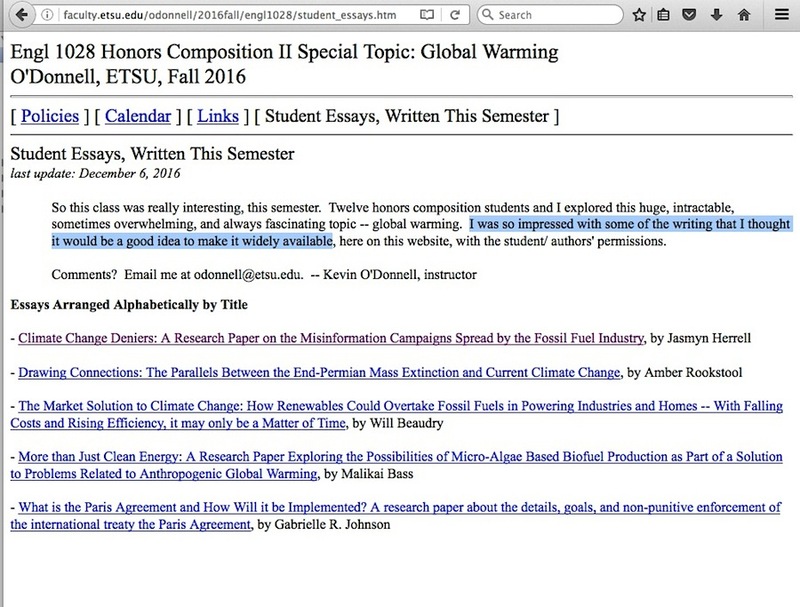 I periodically do Google searches for Gelbspan, and my most recent search turned up a result at docplayer.net of a college student’s November 29, 2016 Honors English Composition paper titled “Climate Change Deniers: A Research Paper on the Misinformation Campaigns Spread by the Fossil Fuel Industry.” It originates at an Eastern Tennessee State University (ETSU) college professor’s small collection of global warming-themed essays, which he deemed so impressive as to be worthy of being shared everywhere. 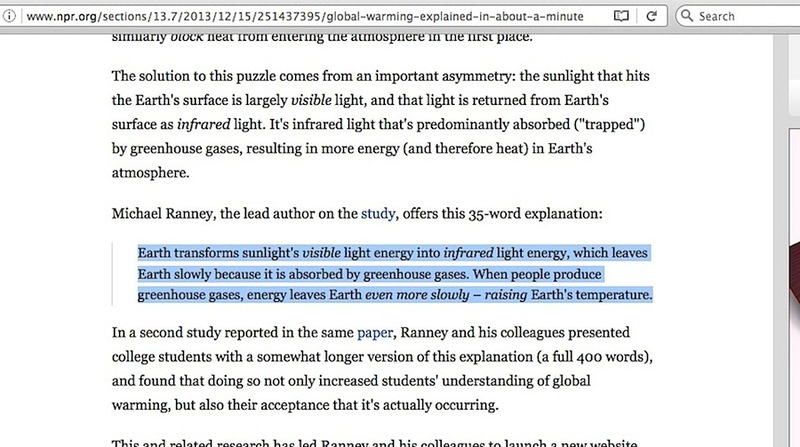 People who don’t know much about the global warming issue might find that student’s paper disturbingly compelling at first glance, but the fatal problem within it arises from elemental examination of her assertions and citations, of which she apparently did not question on her own, including an assertion no further than the third sentence of her introduction about Ross Gelbspan being an “expert.” It’s easy to find him described like that, as seen in my own September 25, 2013 blog post, “When is a ‘Climate Change Expert’ not an Expert?”. 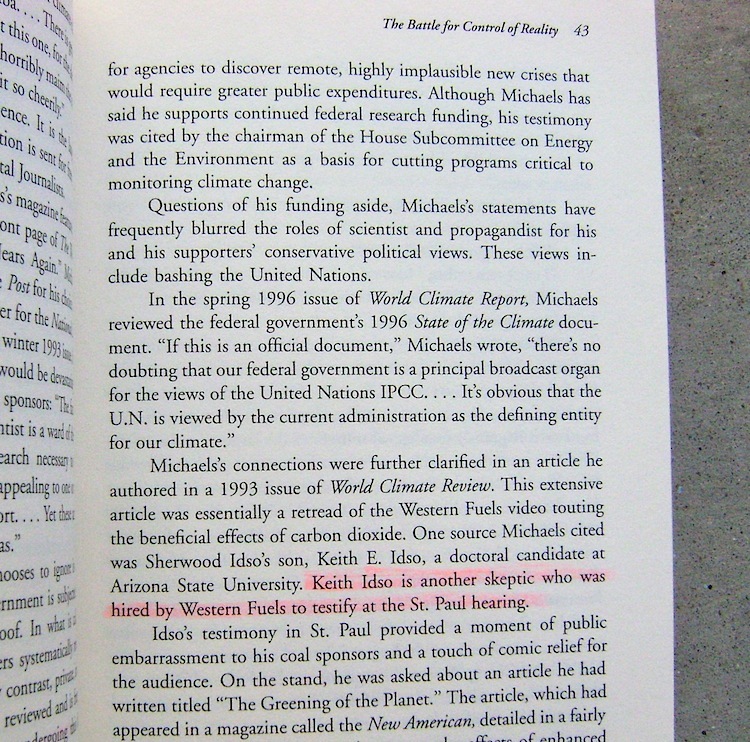 However, he is as much of an expert on climate science as Senators Mitch McConnell, Joni Ernst, former House Speaker John Boehner, Florida Governor Rick Scott. 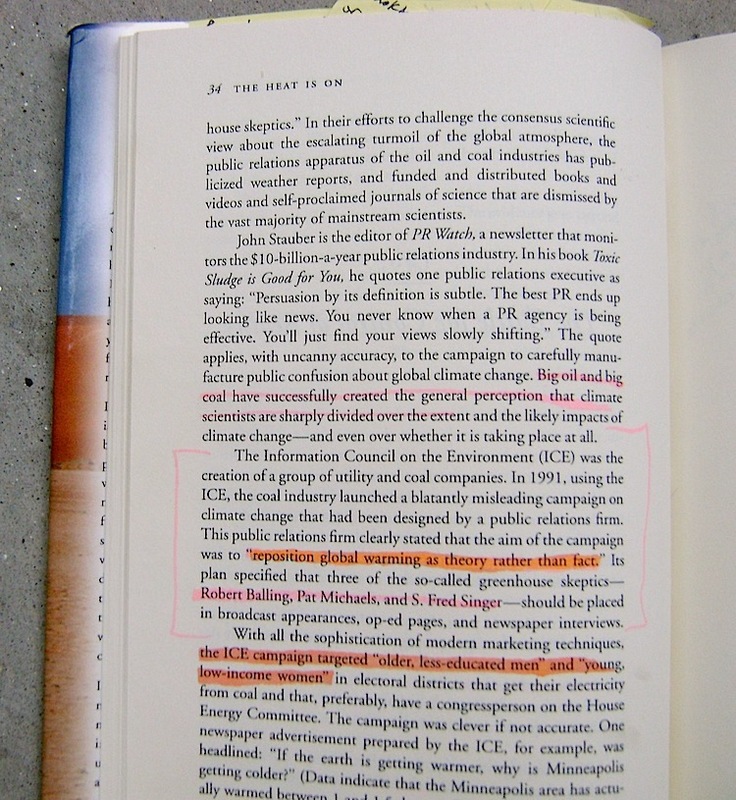 If such non-climate scientists are unworthy of consideration, shouldn’t former Vice President Al Gore and Gelbspan also be dismissed in no less than the same manner? 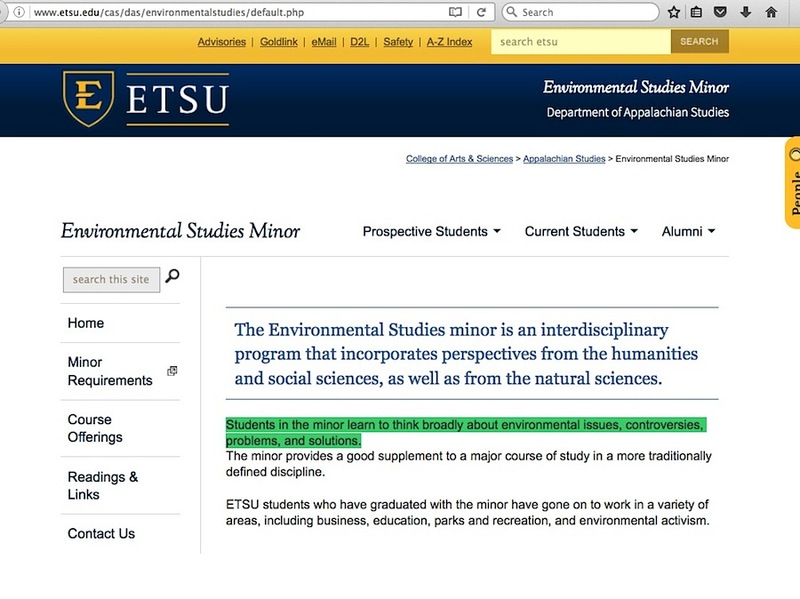 One has to wonder if such broad-minded questioning is permitted in the ETSU college professor’s Environmental Studies Minor curriculum. 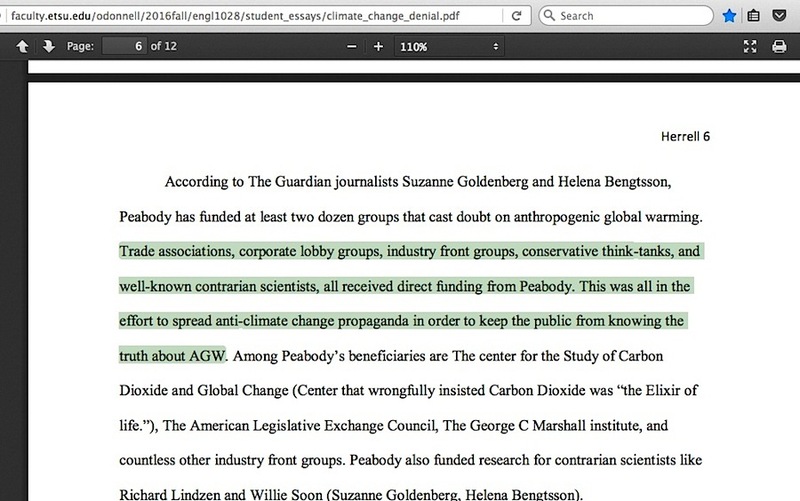 page 5: The Union of Concerned Scientists’ “Climate Deception Dossiers” did not actually reveal any evidence of a pay-for-performance arrangement between fossil fuel people and skeptic climate scientists, but their “Dossier #5 instead revealed them to be enslaved to Ross Gelbspan’s two decade-old baseless accusation, as I detailed in my July 9, 2015 blog post. 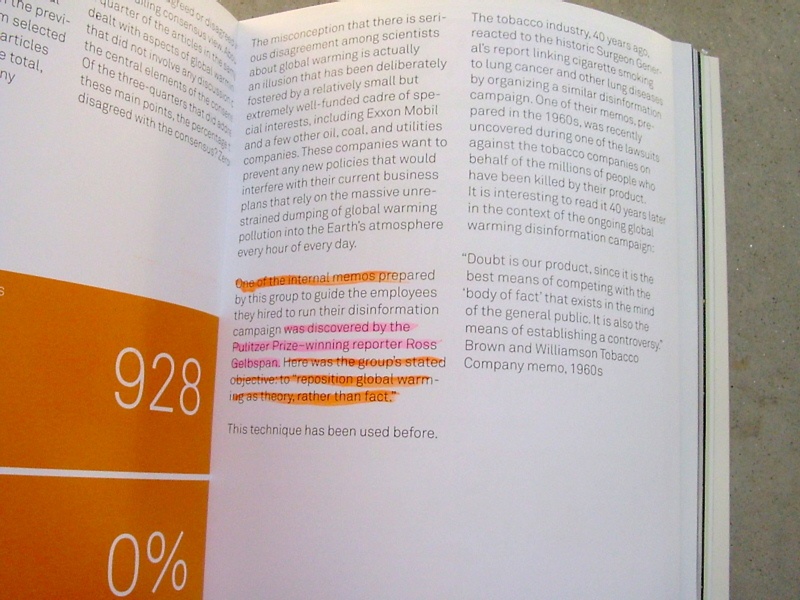 page 6, on funding: The idea that ‘people funded by corporate interests are corrupt’ is worthless without evidence that the money corrupted the people to fabricate false material. 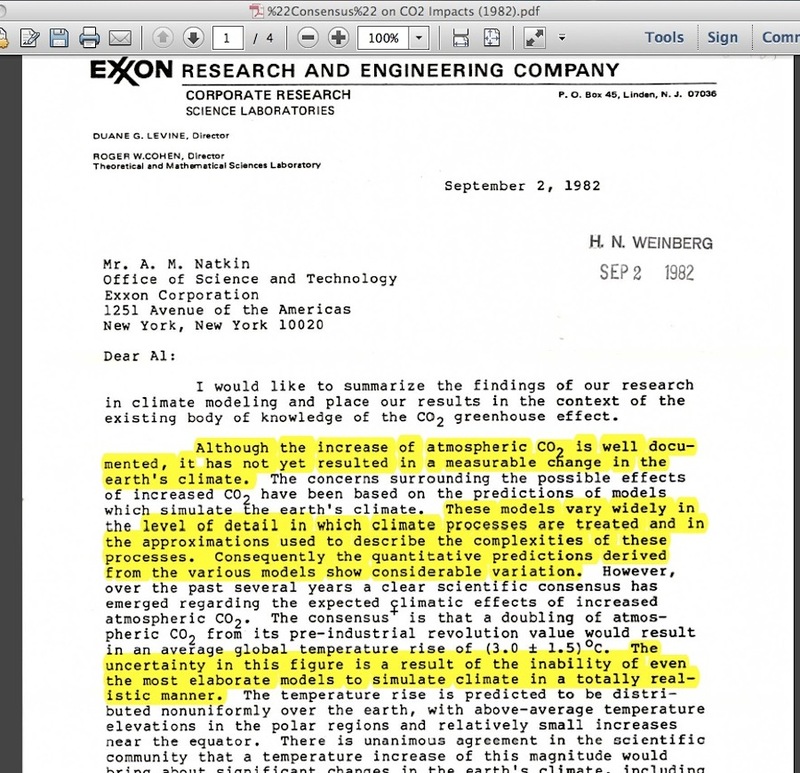 page 6, on the “Exxon Knew” insinuation: No mention is made of Exxon’s forceful statement about the Inside Climate News organization selectively choosing information, and careful reading of actual Exxon documents (e.g. 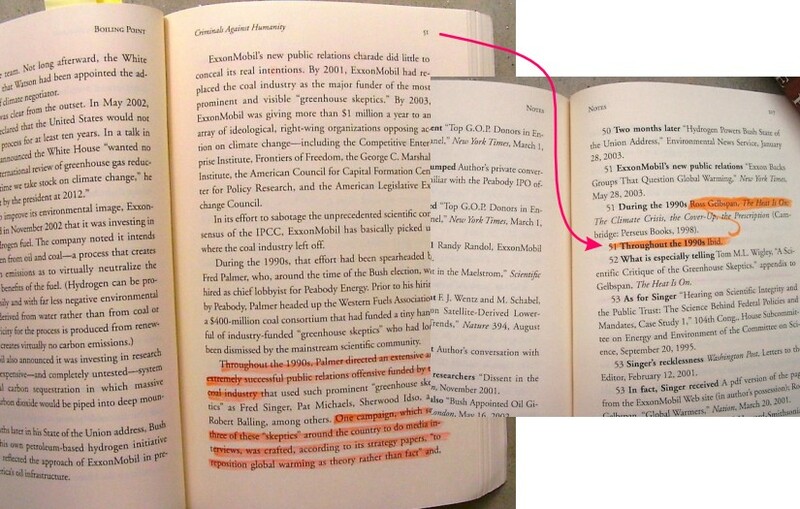 this one) shows Exxon people questioning the validity of models predicting future climate conditions. 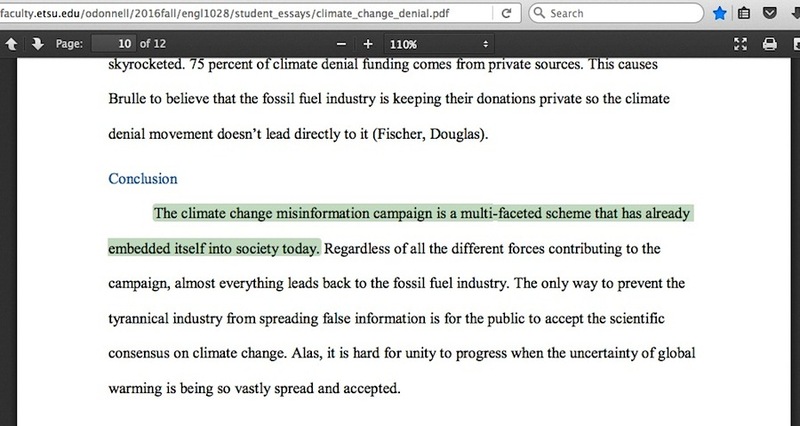 page 7, on Kochs / Exxon funding of the Heartland Institute: here, the student makes an outright false statement and insinuation. 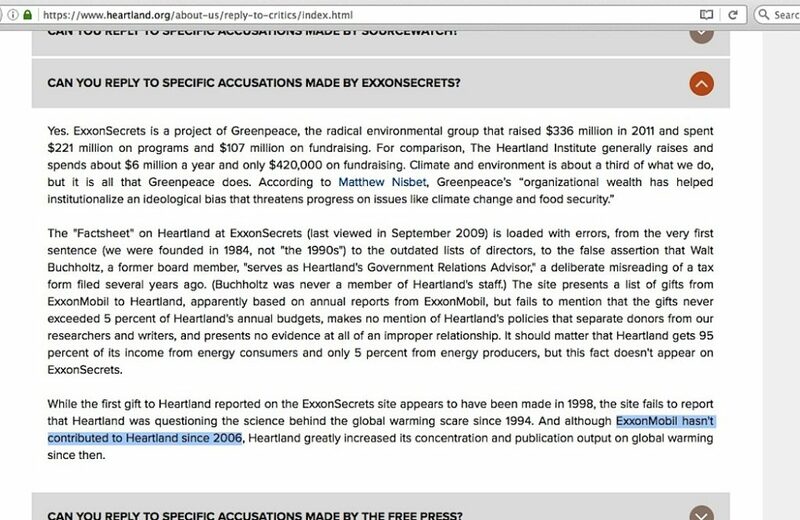 Heartland has not received Exxon funding since 2006, and Heartland’s Koch funding is not directed at the global warming issue. 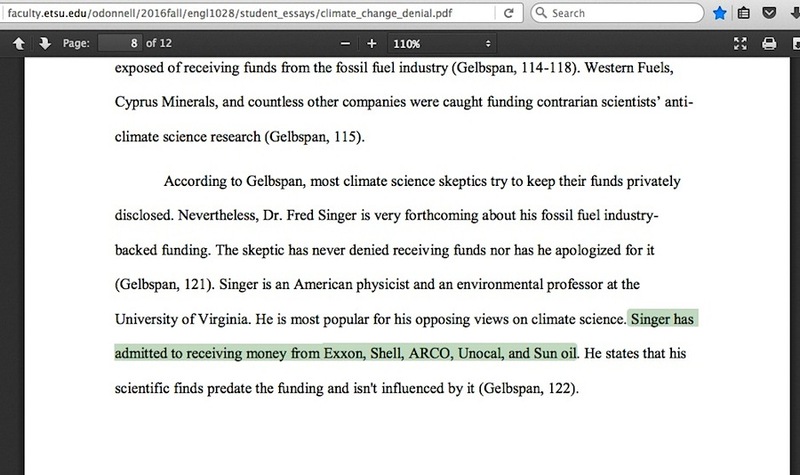 Regarding the swipe at Dr S Fred Singer and Dr Willie Soon, the only ‘confessions’ Dr Singer ever made was that he’d received oil company funding for oil pricing consultation work years before the global warming craze began in earnest, and that he received a one-time unsolicited $10,000 donation from Exxon. 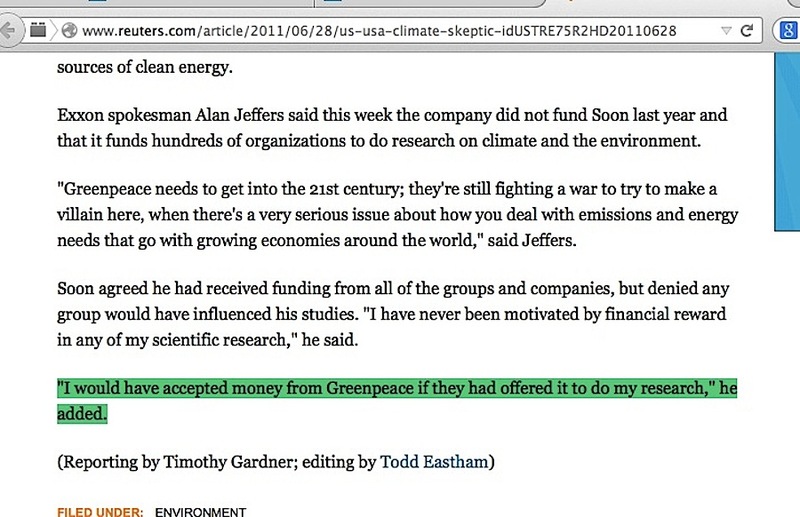 As I pointed out at the end of my July 26, 2013 post with Dr Soon’s comment challenge, Dr Soon said he would have gladly accepted money from Greenpeace. 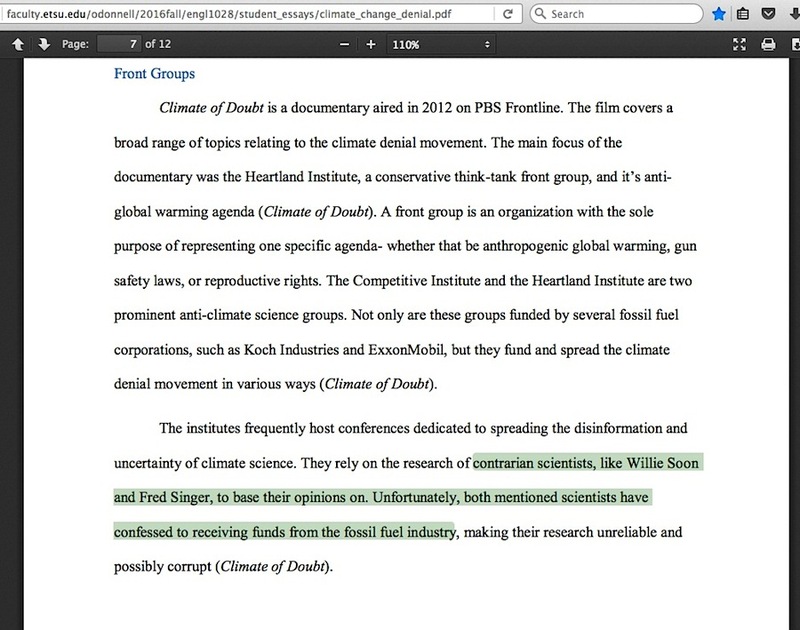 Further, the PBS Frontline “Climate of Doubt” program referenced by this student had numerous problems, which I detailed back in 2012.
page 8, on the alleged Western Fuels Association funding of skeptic climate scientists and Ross Gelbspan’s ‘revelation’ of this ‘corruption’: If I was the professor grading this student’s paper, I’d hand it back to rewrite, criticizing its completely incorrect book page citations on this page. 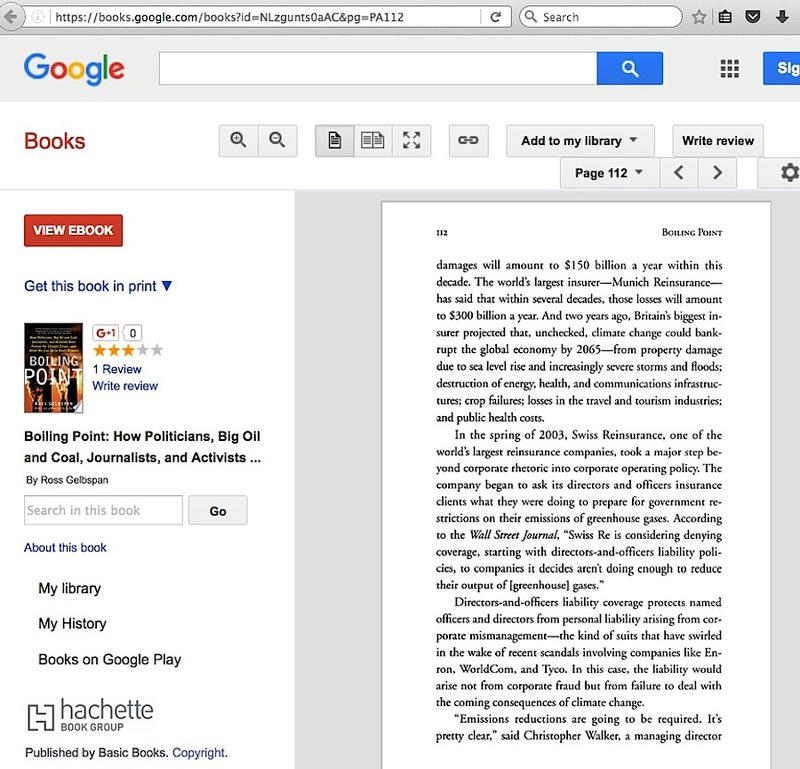 She clearly cites Ross Gelbspan’s 2004 “Boiling Point” book in her page 11 “Works cited” section. 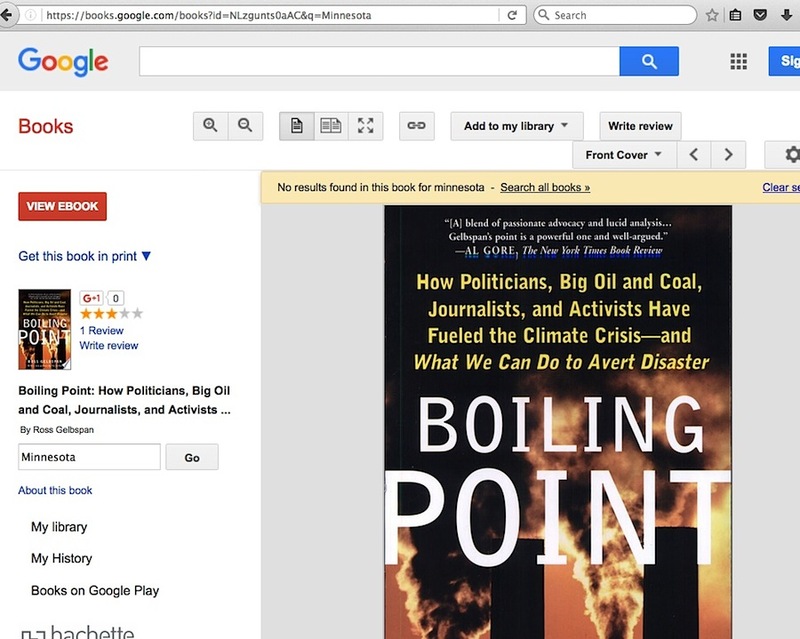 Everything she attributes to “Boiling Point” here – the bit about the Minnesota hearings, ‘four testifying scientists’ supposedly on page 112 (with Willett Kempton as one of the ‘scientists’) – is not in that book. 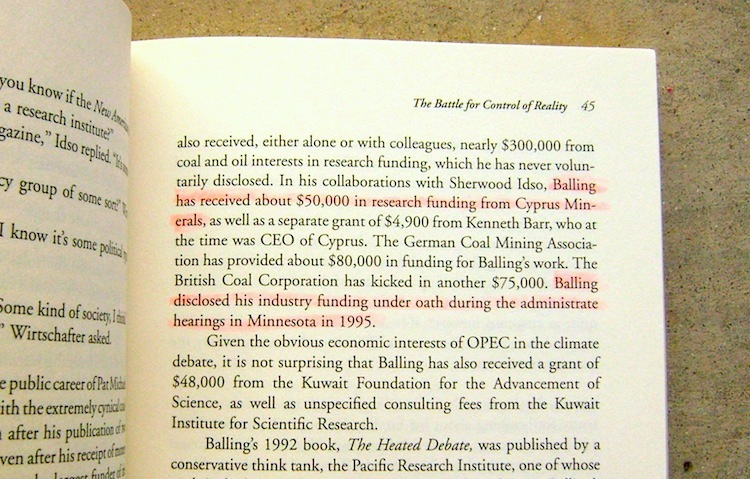 The names of three of the scientists brought in to the Minnesota Public hearings by Western Fuels, Drs Lindzen, Michaels and Balling, are on page 39 of Gelbspan’s 1997 “The Heat is On” book, and Professor Willett Kempton – a person having nothing to do with the hearings – is mentioned on the next page, while Gelbspan mentions the fourth Western Fuels-sponsored scientist, Keith Idso, on page 43. 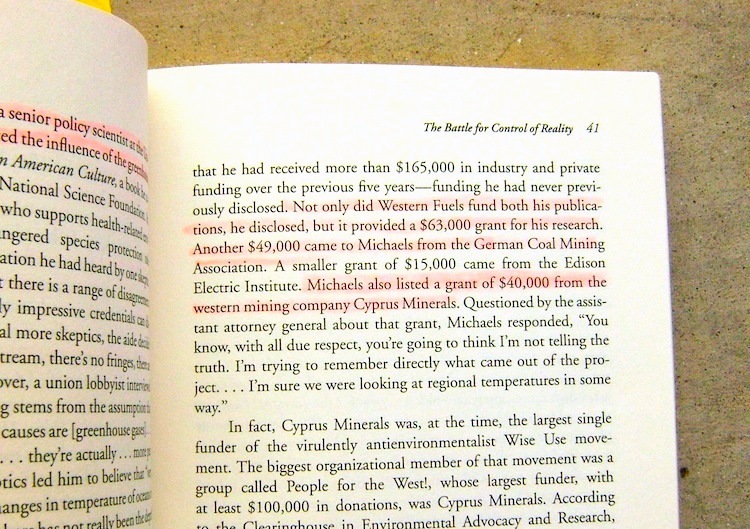 References about Cyprus funding are on pages 41 and 45, which other writers also at least correctly attribute to the paperback version of Gelbspan’s 1997 book. 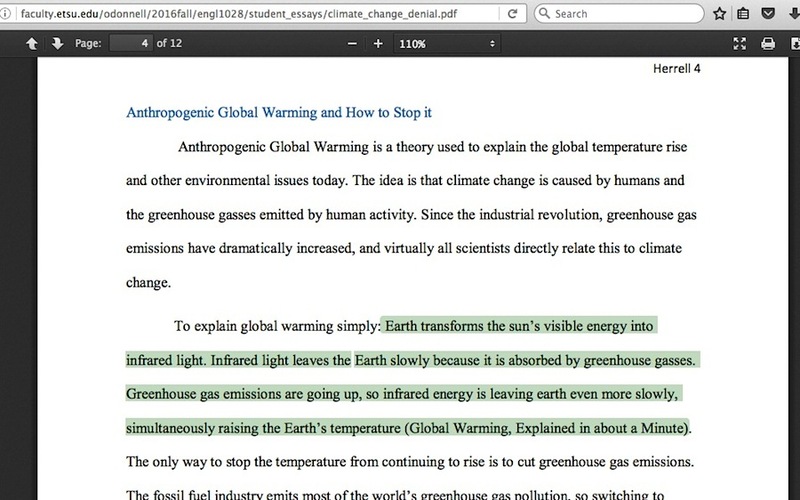 It only gets worse from there, regardless of which book the student intended to cite. 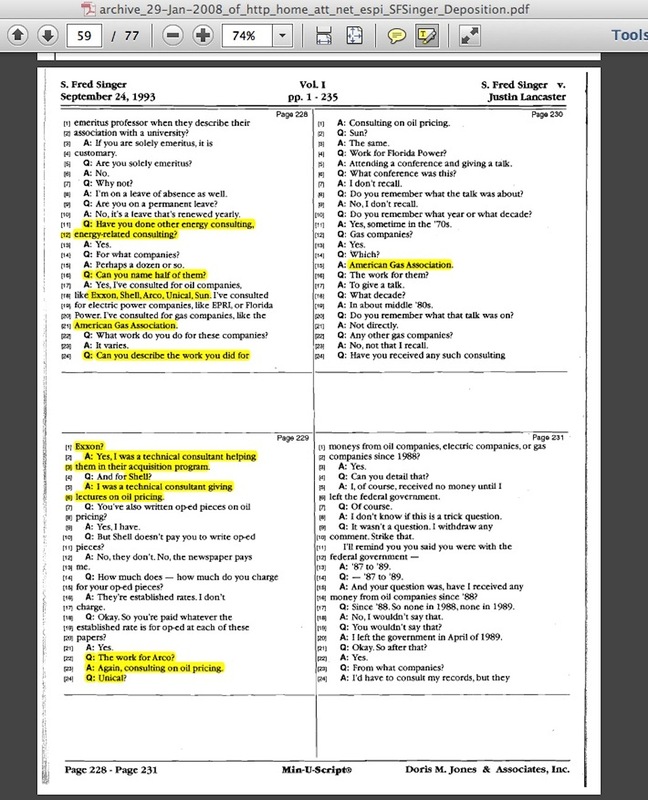 Tedious as it may be to read, the effort to go through each scientist’s testimony – here (Lindzen’s begins at pg 27), here, (Lindzen resumes at pg 3, Michaels begins at 10) and here (Idso at pg 3, Balling at 17) – reveals that none of them offered anything remotely close to simple dismissal of global warming as a hoax. 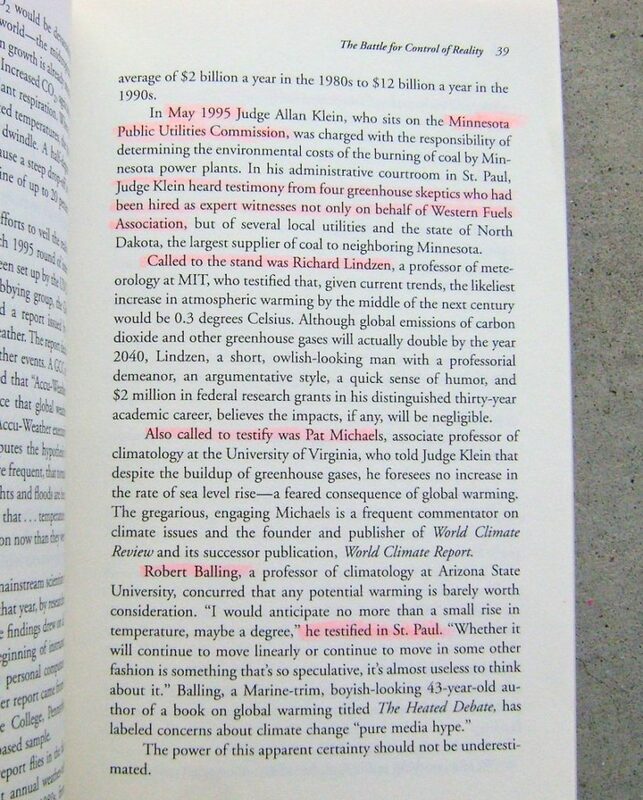 Additionally, I explored serious problems with Gelbspan’s ‘corruption discovery’ narratives about the 1995 Minnesota Public hearings here. But there’s more, and I detail those problems in a series of blog posts tagged here. 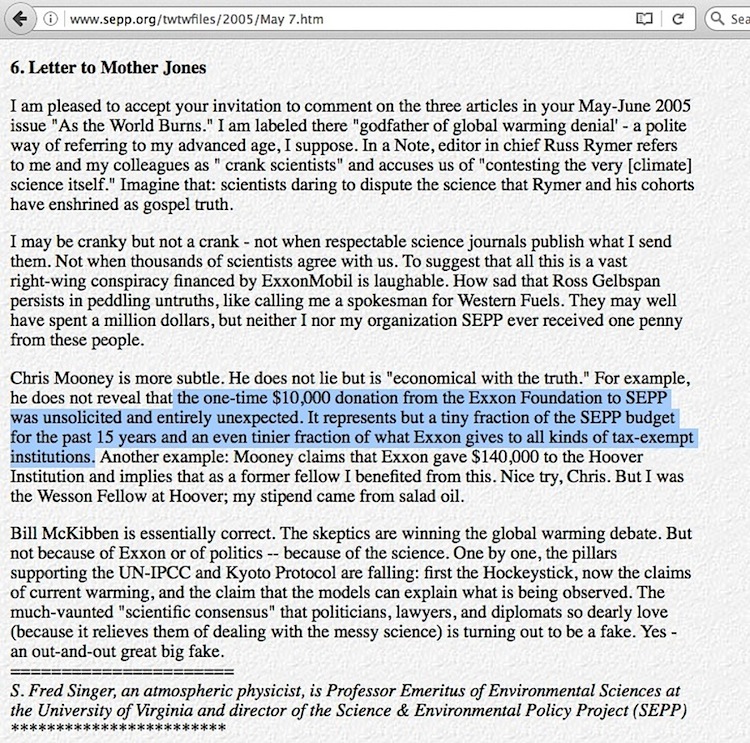 page 9 on Desmogblog: That organization does not actually shed light on the corruption of skeptic climate scientists, it was a vehicle from its inception to the present for the baseless accusations of Ross Gelbspan. 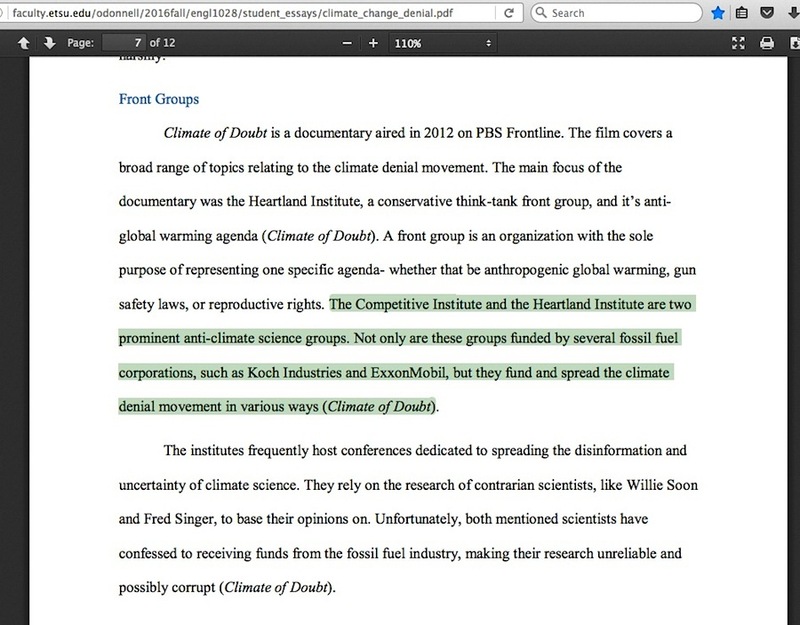 But the student’s assertion that Desmog “received confidential documents from an insider at the Heartland Institute” is an outright misstatement. 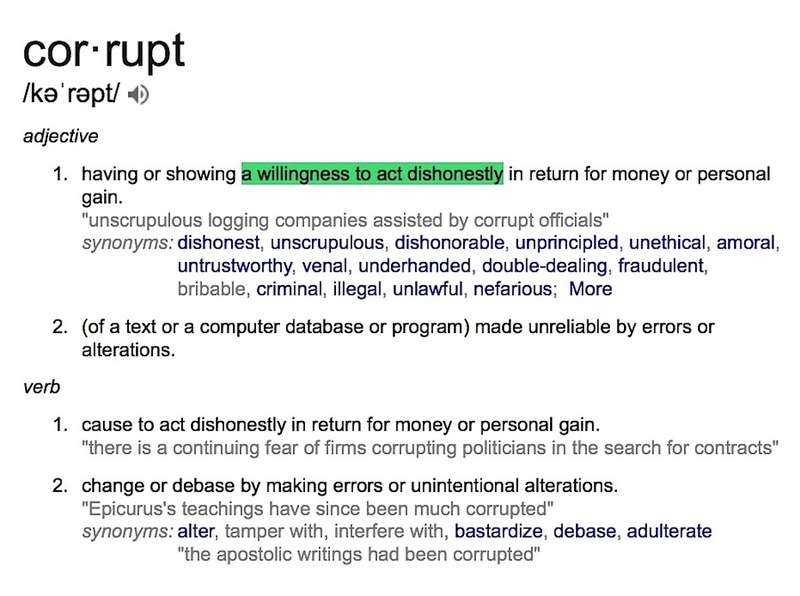 The person who got funding documents devoid of corruption evidence had to commit identity fraud in order to get them. 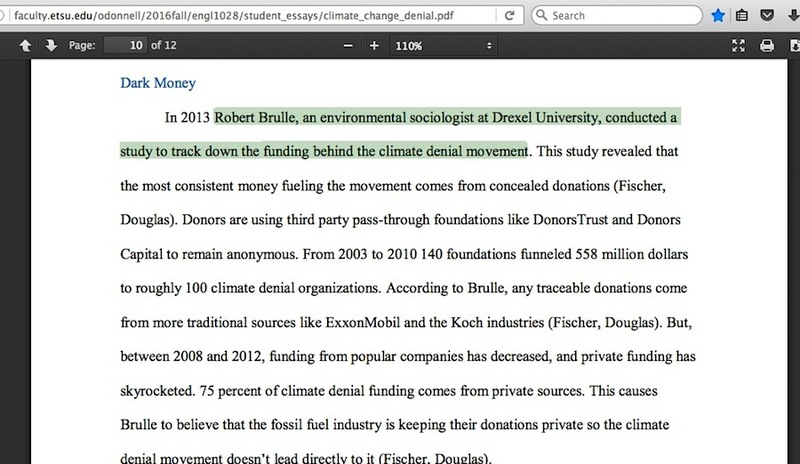 page 10 on Robert Brulle: Similar to other like-minded sociologists, Brulle bases his premise of ‘industry-funded climate denial’ on the notion that skeptic climate scientists have been proven to be crooks, and the source for such sociologists ultimately spirals back to one solitary source: Ross Gelbspan. 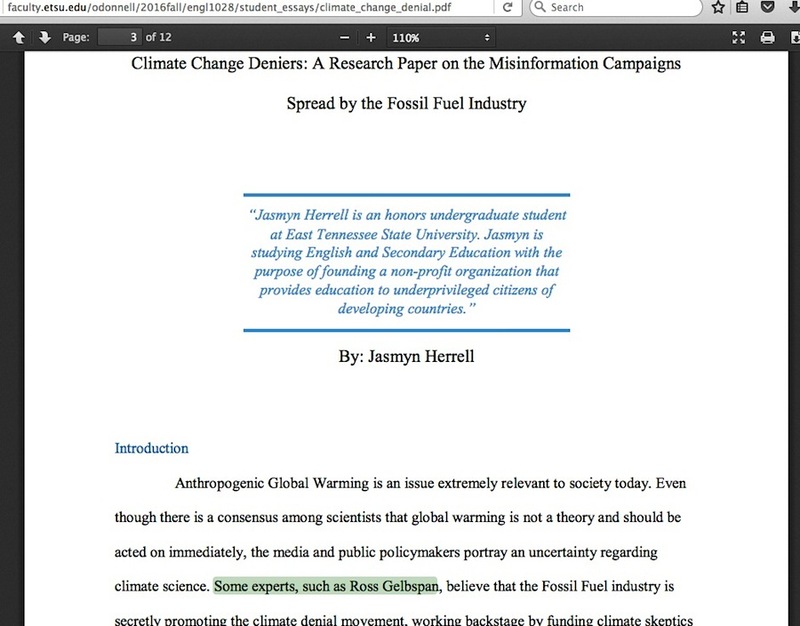 page 10’s Conclusion: The student’s ‘climate change misinformation campaign is a multi-faceted scheme’ statement is technically true, but regarding the assertion about “almost everything leads back to the fossil fuel industry,” this student’s paper inadvertently becomes a case study of how scrutiny of every angle of such accusations does not actually reveal the appearance of a disinformation campaign created by the fossil fuel industry, but instead one apparently created and promulgated by enviro-activists, supported in a major way to this very day by character assassination accusations from a single source – Ross Gelbspan and the clique of enviro-activists surrounding him. 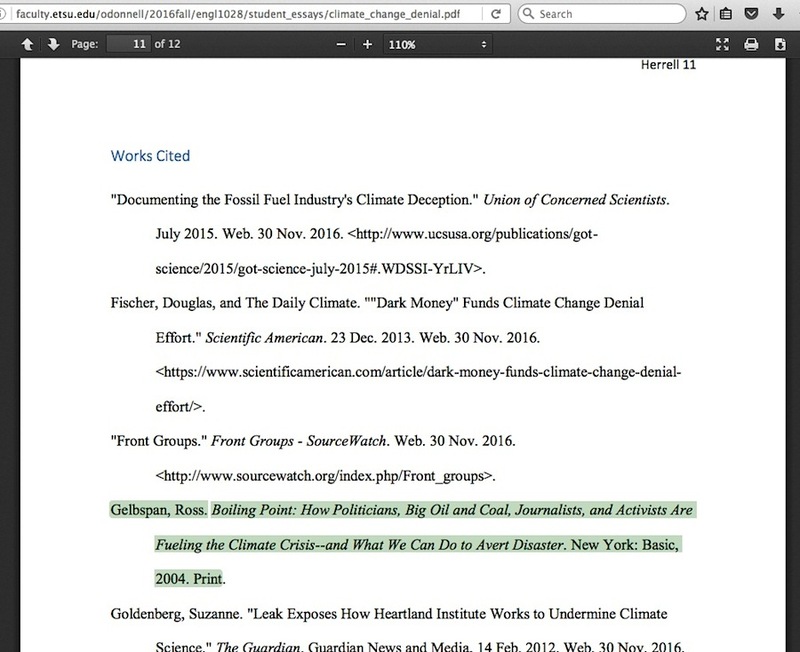 A fascinating exercise for any objective reporter to undertake would be to ask the student to cite actual physical evidence (full context document scans, undercover video/audio transcripts, leaked emails, money-transfer receipts, etc.) 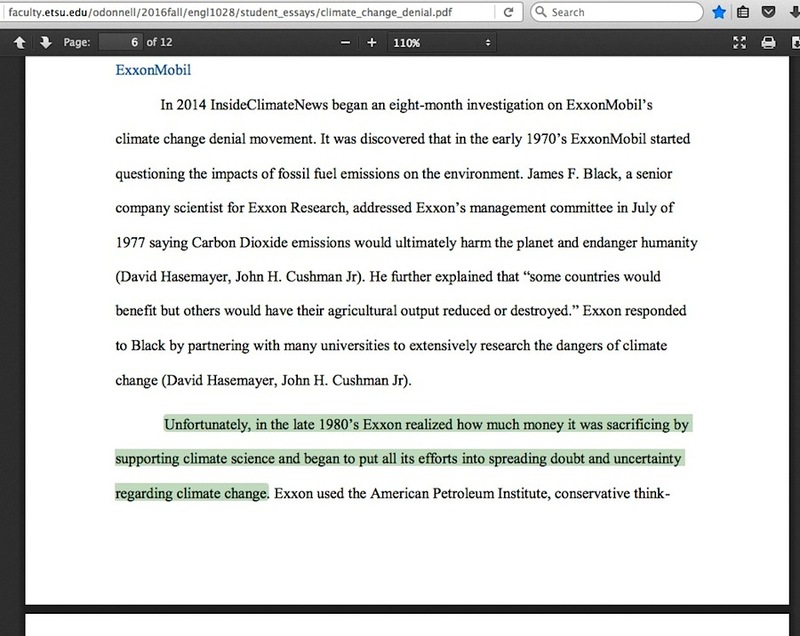 proving skeptic scientists were paid to fabricate demonstratively false science papers, reports, assessments or viewpoints — material that could stand up in a courtroom evidentiary hearing proving a pay-for-performance arrangement exists. However, it would be unfair to challenge her about this, she will probably only stammer helplessly while pointing to Ross Gelbspan’s 1997 “The Heat is On” book. Forget about this one student, though. 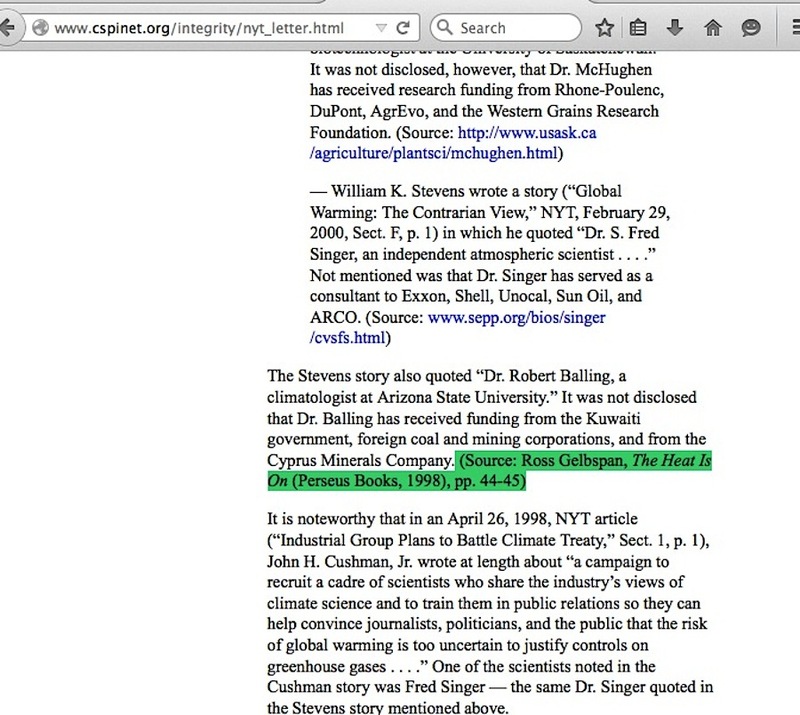 Imagine what might happen if objective reporters or congressional investigators confronted specific “Greenpeace USA née Ozone Action” people or Desmogblog people, or “Merchants of Doubt” documentary movie star Naomi Oreskes, or Rhode Island Senator Sheldon Whitehouse, or former Vice President Al Gore, or the main man himself, Ross Gelbspan? What guarantee is there that such luminaries won’t be reduced to the same embarrassing predicament …. and who would Gelbspan end up pointing to? 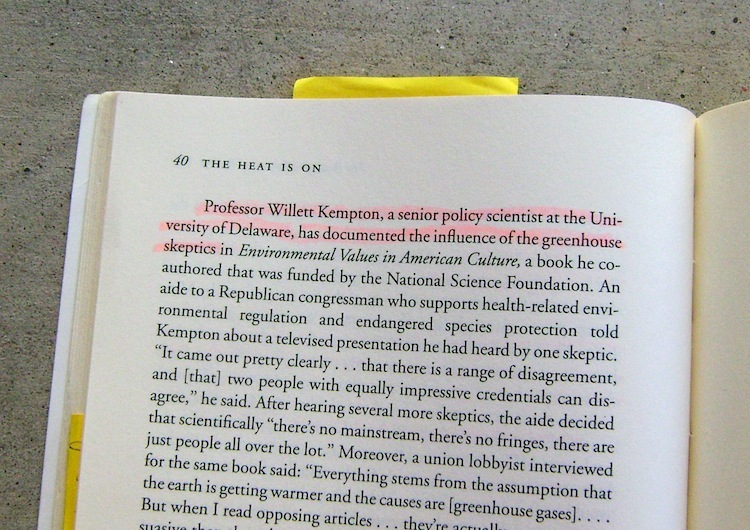 After all, there is just one set of ‘smoking gun’ leaked memos which Gelbspan made famous in his 1997 book that this student cites (albeit indirectly) which Al Gore said Gelbspan discovered, despite Gore having the memos in his possession long before Gelbspan first mentioned them. 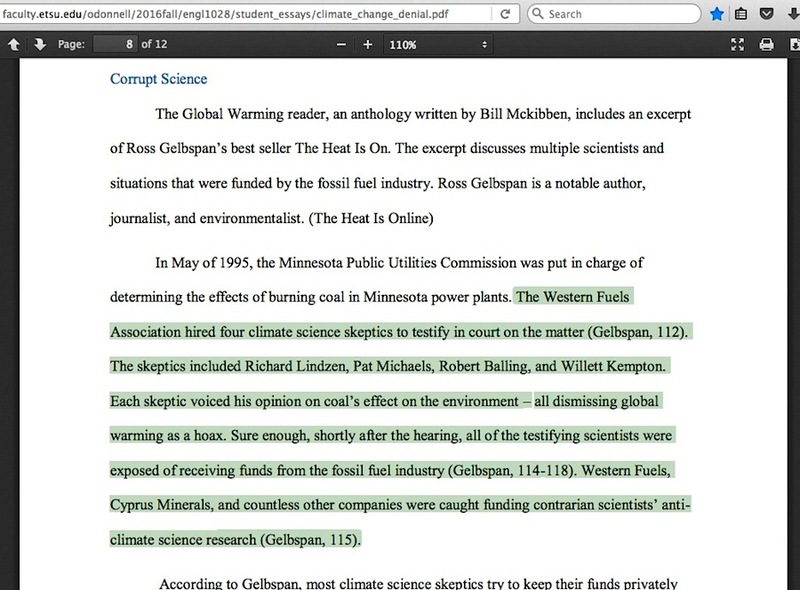 See how this becomes a massive problem for Gelbspan, when the only thing he can point to is material which is not what he, Oreskes, or Gore portray it to be? 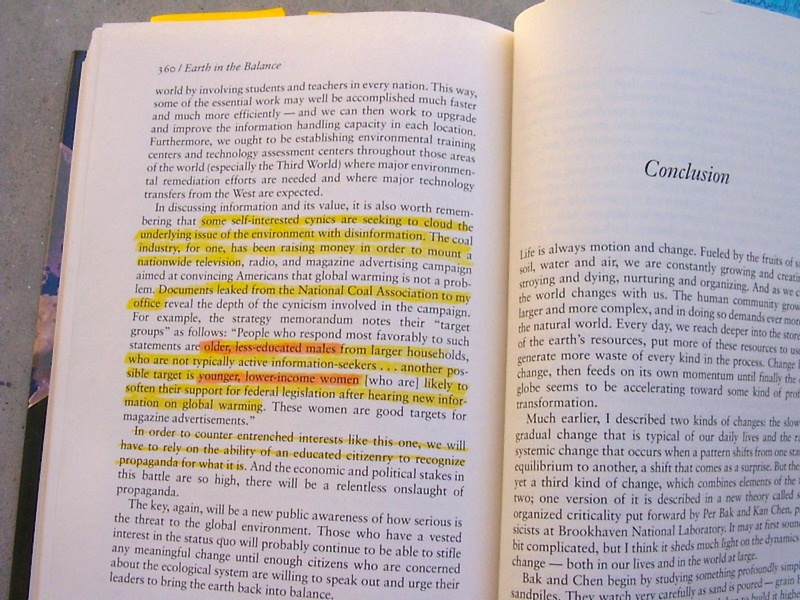 The far bigger question out this exercise today is, what’s being taught and rewarded in colleges these days, deep critical thinking, or the unquestioning promulgation of superficial propaganda? 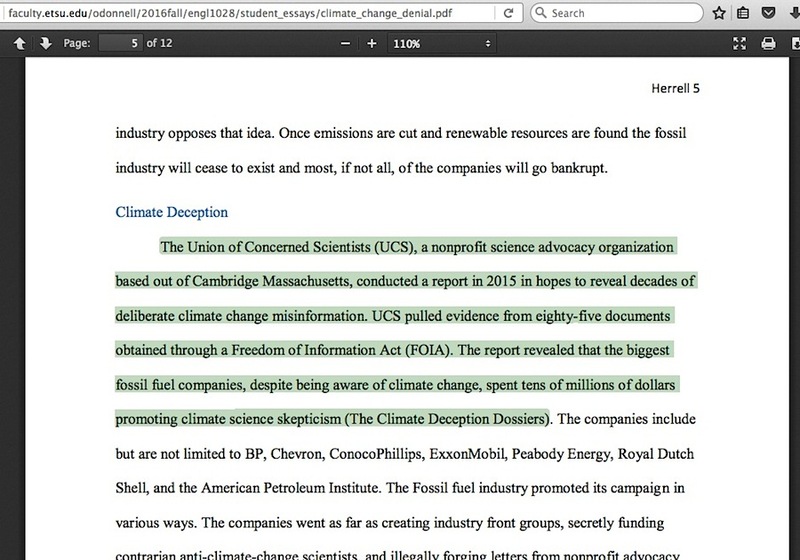 I’ll grant that detailed material such as climate science is beyond the scope of politicians, bloggers and most college students, but when it comes to elemental accusations of corruption, people ranging from the President of the United States on down to college professors, bloggers and students like the one I feature here can undertake basic due diligence to see if the ‘industry-corrupted skeptic climate scientists’ accusation is above reproach. This entry was posted in School propaganda by Russell Cook. Bookmark the permalink.